Third issue in now, and this series still stands on its own two feet. It is not dependent on any other books to give it a voice, to support it in anyway. Which is extremely refreshing, given the current tendency in comics from the Big 2 for various titles to be so involved with each other, in intricate storylines that span dozens of characters, whether good or bad. And given the high-profile character featured in this series, something like that would have been expected. But I’m glad that Edmondson and Noto are staying away from any such notions. In the previous two issues, Edmondson provided a nice twist to both stories, such that you were taken in by surprise after reading them, since they took a very different direction to what you had come to expect. Edmondson repeats that approach here. But there is something lacking. I enjoyed the story, but it didn’t impress me as much as the previous two stories have. The exploration of Natasha’s moral compass and the establishment of it is as exciting as ever, but this time it felt weak because in some way it was perhaps a repetition of what Edmondson has done. But at the same time, he goes the extra mile and he does a very personal story for Natasha this time, involving one of her neighbours. Sure, it is a bit of a cliche, but I think that, as ever, the execution is what ultimately sells it all. I like seeing this deeper side of Natasha since the movies haven’t done all that great a job of it, and since rumours are that this series will spring off to a movie for the character at some point, this is all well and good. Establish the character, and then use what’s come in the current comics to develop her further for her own solo movie. A good approach I think, especially one that rewards the cross-media fans. I know that I would love something like that, to see the movies and comics tie in with each other in a subtle way, so that even though there are no required readings, the overall experience is still good. Phil Noto doesn’t get as much room to do any creative stuff with this issue as he did in the previous two, whether we talk about the action moments of the drama. Everything is very straightforward. Its not a bad thing per se, but it does stand out in comparison to what he has already done on the series. The clean artwork reflects the story since Natasha operates on very simple principles in the course of her work, and the colours here speak to her somewhat dour attitude this time around, so that’s a good thing in a way. 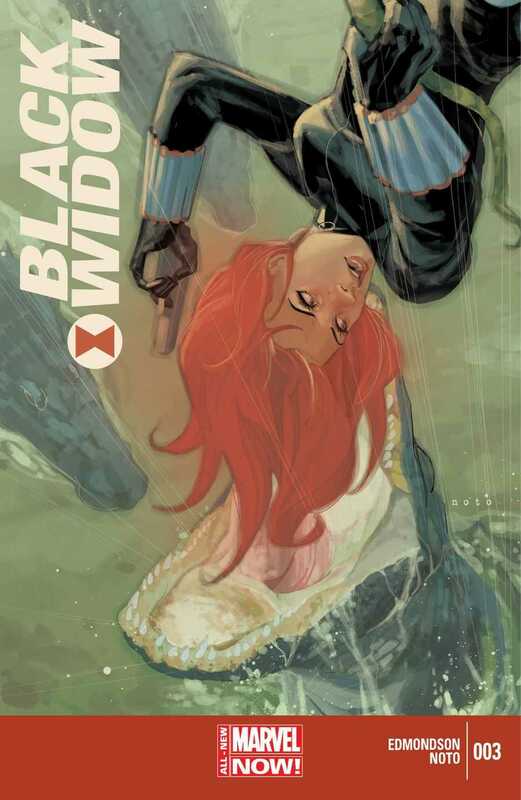 More Black Widow: #1, #2. Posted on February 6, 2014, in Comics Reviews, Review Central and tagged All-New Marvel NOW!, Assassin, Avengers, Black Widow, Comics, Comics Review, Espionage, Female Characters, Maria Hill, Marvel Comics, Marvel Now, Natasha Romanoff, Nathan Edmondson, Phil Noto, Review, Review Central, SHIELD, Superspy, VC's Clayton Cowles. Bookmark the permalink. 9 Comments.